India held its nerves to clinch a thrilling encounter against Bangladesh in the final of the Nidahas Trophy T20I tri-series at the R Premadasa Stadium in Colombo on Sunday. It was a blockbuster tie that had fans hooked to their seats until the last ball of the match as Dinesh Karthik turned out to be India’s hero in the end. Experienced campaigner, Dinesh Karthik hit an 8-ball unbeaten 29 runs to clinch a nail-biter. 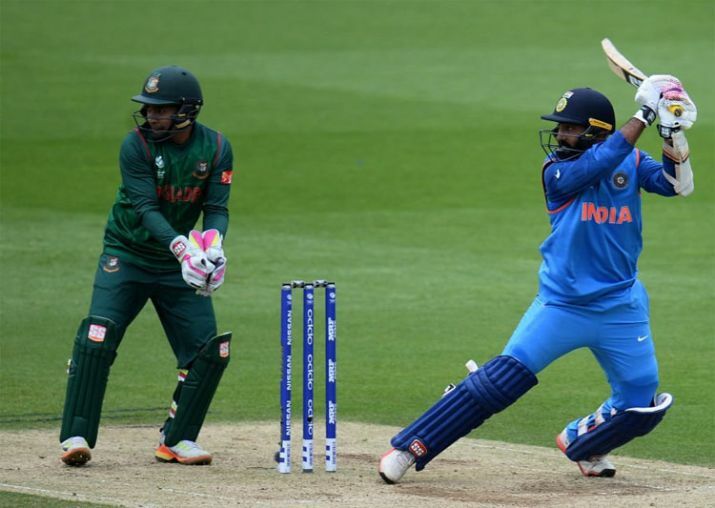 With the Asian giants needing five runs from the final ball of their chase, Karthik smashed a half-volley of Soumya Sarkar for a six over sweeper cover to hand India a memorable victory. Bangladesh players were consoling a dejected Saumya Sarkar, who was reduced to tears after seeing his side lose the match and the trophy. One must laud Bangladesh for giving a solid fight to India after scoring 166 runs in 20 overs. In pursuit of the chase, the ‘Men in Blue’ finished it off emphatically getting to 168/6 and winning another trophy to continue their supreme form in limited overs cricket. Karthik’s magic came right from the moment he got into the crease by smashing two sixes and a four off Rubel Hossain, who was handed the 19th over. Prior to that, the Tigers got the momentum and it looked very difficult for India at one stage as the match virtually slipped out of India’s hand. But Dinesh Karthik had other ideas and he used his vision to get India past the line. DK was adjudged the man-of-the-match award and he lauded the support staff in his post-match conference. “I have been practising these shots – having a strong base and then hitting from there. Happy to be where I’m and thanks to the support staff who have kept on supporting me for the last few months,” said Dinesh Karthik. Rohit Sharma left from where he finished the last match after hitting another solid fifty. His 56 runs laid the platform for India, who lost Shikhar Dhawan (10) and Suresh Raina (0) early on in the chase. Rohit added a fine 51-run stand for the third wicket with KL Rahul (24) giving India some solidity. After Rohit’s dismissal, Manish Pandey (28) took charge and batted sensibly to keep India in the hunt in what was a difficult period to bat in. Pandey fell in the final ball of the 18th over, with India needing 33 runs off the final two. In came DK who changed the outlook of the game. This is the third successive T20I tournament win for India and the cheers in the camp suggested how much they loved the action. Earlier, Sabbir Rahman was the star for the Bangladeshis as the player hit a superb 77 off 50 deliveries to help his side get to 166/8. He was well supported by Mehidy Hasan (17*) as Bangladesh put up a competitive score. For India, it was Yuzvendra Chahal, who bowled intelligently and took 3/18 in four overs. He got the key wickets of Tamim Iqbal (15), Mushfiqur Rahim (9) and Soumya Sarkar (1) to give India the impetus. Chahal finished the series with eight wickets as he continued to build on his rise as a bowler. Rahman batted beautifully hitting seven fours and four sixes especially after targeting the likes of Shardul Thakur and Vijay Shankar. The dangerous customer was finally castled by Jaydev Unadkat in the 19th over. The left-arm quick bowler also got Rubel Hossain in the next ball for a duck, which somewhat dampened Bangladesh’s charge. A host of former and present Indian cricketers lauded Karthik and the team for clinching the trophy.